Rebounder by Needak for a Soft Bounce! Due to the gravity factor or 'G-force' - bouncing with weights is way more effective than weight training without rebounding. Consider hand weights and/or leg weights to maximize your rebounder workouts. When is the Best Time to Bounce? Aerobic and strength bouncing like any strenuous exercise should be done on a fairly empty stomach. So do your 10 to 40 minute workouts before or at least one hour after a meal. Blood PCO2 decreased with age (p.05), in keeping with the expected respiratory adaptation to metabolic acidosis.Such age-related increasing metabolic acidosis may reflect in part the normal decline of renal function with increasing age.The role of age-related metabolic acidosis in the pathogenesis of the degenerative diseases of aging warrants consideration. In layman's terms, it means that as we get old we have more acid radicals [H+] and less bicarbonate [HCO3-], which brings about age-related metabolic acidosis.This paper is the recognition and treatment of the symptoms, accepting aging as an inevitable fact of life. Find a space in your home where the rebounder will have a few feet of open area around it, preferably where you can keep it set up. If it is visible and easily accessible you will be much more likely to use it regularly. An ideal location is in front of a TV and close to a source of music. Bounce outside when the weather permits - a great way to get your sun and Vitamin D for the day! A permatron mat is not damaged by ultraviolet rays from the sun. Just about every body can bounce. Whether you are young or 'mature', fat or thin, fit or breathless, male or female (even pregnant women can do gentle bouncing through their 5th month), regardless of race, creed, political affiliation or food ideology - your physiology will benefit from bouncing on a high quality rebounder. Some dogs and cats like it too! Even folks recuperating from injury or illness can rebound. 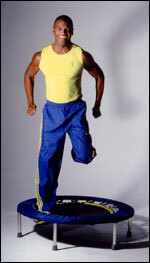 Dr. James White, researcher at the physical education research laboratory of UC San Diego and the author of "Jump for Joy" (Arco Publishing 1984) found that 93% of the patients that received recuperative assistance at his facility (the total number being 2300 individuals over a 7 year period) were able to incorporate rebounding into their rehab programs - with excellent results. If you have reason to suspect that you may be one of the few who would not benefit from bouncing especially if you are recuperating from an illness or injury - please check with your physician before starting a rebounding program. Safety, Support & Stability - Should You Buy a Stabilizer Bar? For a healthy and active person the bar is not necessary but is great for practicing new moves and doing those high kicks that trim the waist, hips and thighs. If you (or someone dear to you) has a concern about falling - then it is a good idea to have a bar for everyone's security, safety, confidence and peace of mind. This unique device adjusts to three different levels, so one bar fits all! And Needak's Stabilizing bar is fully portable, as it easily disassembles into 4 pieces which can be stored in the folding-rebounder carrying bag for true portability! Don't let a balance concern prevent you from joining in the fun. By adding theStabilizing Bar to your Needak Soft-Bounce Rebounder you can have the confidence and security you want. This unique device adjusts to three different height levels - one bar fits all. Simply hold the bar as you bounce. Other Specs: The Needak rebounder is 40 inches in diameter and stands 10 inches tall. The "Jump Mat" is 28 1/2 inches in diameter giving ample room for exercises of all types. Hidden beneath the spring cover is the Needak hinge - time tested and virtually indestructible. It is securely welded to the frame, providing the safest, most stable rebounding platform available. Needak offers 2 frame styles: Our Non-folding rebounder has a solid frame and legs that fold under the rebounder for ease of storage. Our folding rebounder allows you to fold it in half. The folding rebounder is just as strong and stable as the Non-folding rebounder with the added versatility of true portability. The Needak spring cover is made of a nylon oxford cloth that is oil, water, and sunlight resistant in addition to having a rip resistant component making this fabric practically indestructible. No inferior leather-like or vinyl covers for our customers. Spring-loaded legs for easy storage under a bed or behind a door. Our folding frame provides you with true portability. The Needak warranty is the best manufacturer's warranty available for rebounders today. We are proud of our rebounder and gladly stand behind it. Rebounding is an exercise that can reduce your body fat; firms your legs, thighs, abdomen, arms, and hips; increases your agility; improves your sense of balance; strengthens your muscles over all; provides an aerobic effect for your heart; rejuvenates your body when it's tired, and generally puts you in a state of health and fitness. You can easily perform this exercise in your living room, your office, and your yard. The traveler may wish to carry a folding rebounder for use in a hotel room. It's the most convenient, metabolically effective form of exercise around. You can add a bounce to almost any movement. 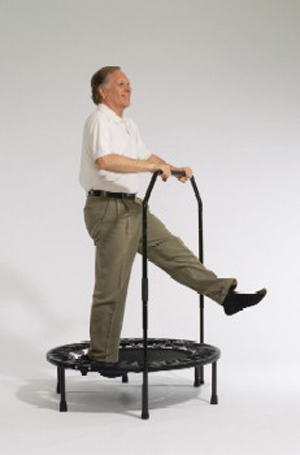 On a rebounder one can walk, pretend to climb a ladder, shuffle - like on a Nordic track, skip rope, jog or sprint. Callisthenic movements like jumping jacks, military presses, arm motions with weights, twists and hamstring curls are easy to do while bouncing. Most kinds of dancing can be adapted to bouncing. You can bounce up to en pointe and plie down, do the highland fling, twist or cha-cha; instead of boogying down - you can boogie up! Practice many sports on the rebounder: skiing, boxing, martial arts, weight-lifting, tennis swings and basketball hoop shots. Step up onto the rebounder and become a gogo bouncer! If you have non-bounce workout videos like any of Richard Simmons "Sweatin to the Oldies" or Tai Bo - see if you can bounce-dance along to them. The health bounce is defined as movements up and down on the rebounder where both feet maintain partial or complete contact with the mat. heel-to-toe rolls, sort of a "rooted walking"
The health bounce is the warm up and cool down movement for rebounding; it should always be done as the first part and last part of a bouncing session. Any kind of arm movement can be added to a health bounce for more variety. These low-level bounces are also called therapeutic bounces because they are sufficient to pump your lymph system, wake up your cardiovascular system and balance your electro-magnetic energy system (chi).If - due to health issues or just plain indolence - you never did anything more strenuous than the health bounce - you would still reap tremendous benefit in stabilizing and maintaining your well-being. These mid-level bounces are the conditioning aspect of rebounding. In addition to maximizing your immune system, they pump your heart and chi. Enough aerobic hopping will slim down your body, tone up your muscles, strengthen your internal organs and improve balance and coordination. I call it a happy hop because of the euphoric endorphin rush that happens at this level of bouncing. Such high-level bounces are the equivalent of strength training in a gym because - when you jump 8 inches or higher - then you land with a force of 2G's (twice the usual gravity) or twice your body weight. So power jumping strengthens each of your 75 trillion cells. These seated bounces are not really another level of intensity - just a different way to bounce. Dave Hall demonstrates seated bouncing called the 'V Sit' which is good for conditioning and strength training.